Aging is a common cause of chronic joint pain, as wear and tear from years of use results in inflammation and osteoarthritis. As a person ages, the body’s ability to regenerate and repair damage to the joints diminishes, resulting in chronic inflammation. This is one of the most common causes of joint pain. Osteoarthritis, the degenerative inflammation of the joints, is the leading cause of disability in people older than age 55. Osteoarthritis causes the joint’s protective cartilage to erode over time, exposing the bone underneath. Joint injuries become more common with age. Contributing factors include decreased balance and motor control, which can lead to falls, and degeneration of the bone from osteoporosis, which can result in greater damage from small injuries. Heating pads, braces, and physical therapy can fully or partially ease symptoms. Prescription pain medications can also be used to alleviate joint pain. In cases of severe osteoarthritis, surgical joint replacement is often recommended. osteoporosis: A disease in which the bones become extremely porous and are subject to fracture, most common among postmenopausal women. fibromyalgia: Chronic pain, stiffness, and tenderness of the muscles, tendons, and joints. osteoarthritis: A form of arthritis affecting mainly older people, caused by chronic degeneration of the cartilage and synovial membrane of the joints leading to pain and stiffness. Analysis of skeletal material from archaeological sites has shown that an individual’s primary activities can be deduced from development of osteoarthritis. For instance, osteoarthritis of the toes, knees, and hips of female skeletons from the site of Abu Hureyra is clear evidence that they spent most of their days grinding flour on stone querns while kneeling on the ground. Joint pain can be caused by a variety of health problems, from arthritis to fibromyalgia. Many temporary conditions, such as a virus or the flu, can also cause joint pain. Joint pain occurs in all age groups, but becomes more common with age as wear and tear on the joints from years of use results in inflammation and osteoarthritis. Older adults are also more prone to injuries that can cause joint pain. 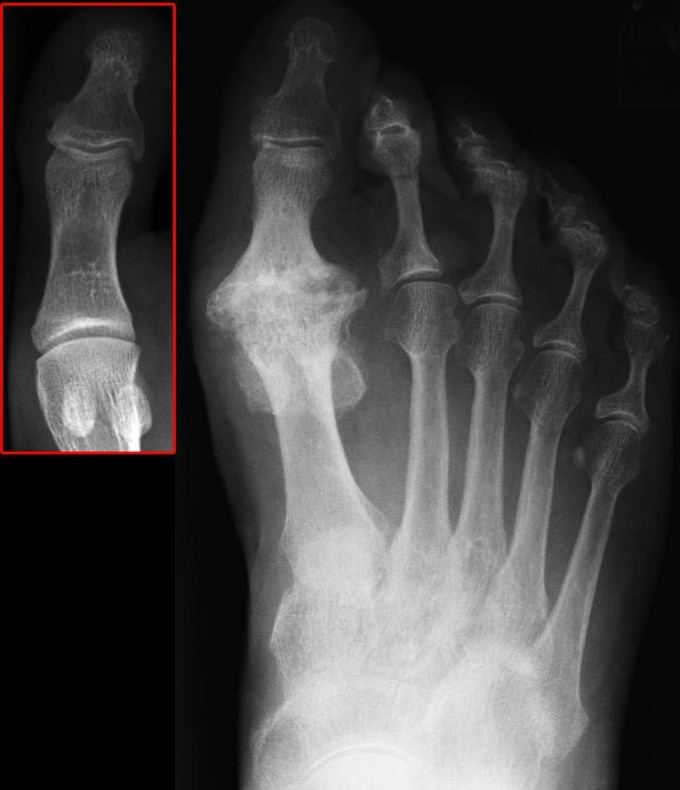 Osteoarthritis: X-ray image of osteoarthritis of the big toe. The red box shows the normal joint. One of the most common causes of joint pain, inflammation is the body’s response to pain, infection, and other threats. As the joints become inflamed, their regeneration and repair process slows, making them weaker. As a person ages, the body’s ability to regenerate and repair damage to the joints diminishes, resulting in chronic inflammation. Osteoarthritis, the degenerative inflammation of the joints, is the leading cause of disability in people older than age 55. Osteoarthritis is typically caused by mechanical stress on the joints, resulting in chronic inflammation leading to the loss of cartilage. With this condition, the protective cartilage of the joint erodes over time, exposing the bone underneath. The bones of the joint then rub together during movement, causing pain and stiffness. As a result of decreased movement secondary to pain, regional muscles may atrophy and ligaments become more lax. Sprains, bruising, broken bones, and many other temporary conditions can result in joint pain. Many of these injuries may not be to the joints themselves, but to their surrounding cartilage and ligaments. Joint injuries become more common with age as decreased balance and motor control lead to falls. In addition, bone degeneration caused by osteoporosis can result in greater damage from small injuries. Many remedies for joint pain are available. Heating pads, braces, and physical therapy can often minimize symptoms. Prescription pain medications can also be used to alleviate joint pain. In cases of severe osteoarthritis, surgical joint replacement is often recommended.